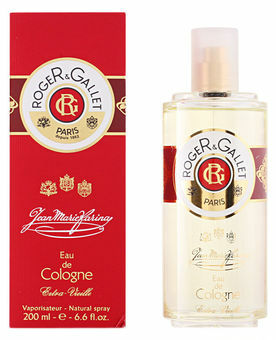 Jean Marie Farina Extra Vieille by Roger & Gallet is a Citrus Aromatic fragrance for women and men. Jean Marie Farina Extra Vieille was launched in 1806. Top notes are bergamot, amalfi lemon, orange and mandarin orange; middle notes are petitgrain, carnation, neroli, rosemary and rose; base notes are clove, myrtle, cedar, sandalwood, musk, white amber and vetiver.